Integrated power solutions manufacturer, Socomec, has developed an advanced range of low voltage electrical solutions for rail specific system architectures that guarantee network safety and robustness – whilst improving the bottom line and improving efficiency. With expertise in critical power as well as power control and safety, energy efficiency and energy storage, Socomec has a track record of success from design and build through to installation and commissioning – with ongoing service support around the clock, all around the world. Delivering robust and efficient solutions for complex critical power requirements, Socomec works with rail partners to meet – and exceed – the exacting requirements of the sector. Providing solutions for traction power, signalling, buildings and on-board rolling stock systems, Socomec provides electrical power products for all rail facility applications – in the most challenging operating environments. Socomec’s low-voltage traction power solutions – for catenary systems and overhead contact lines, including substations – have been engineered for use in severe weather conditions and have fire-resistant features ideal for underground networks. Furthermore, the range of Uninterruptible Power Supplies (UPS or inverters) and DC rectifiers guarantee the power supply to control and monitoring systems whilst ensuring a high availability of low-voltage energy. The switchgear and protection solutions – integrated in AC or DC protective enclosures – ensure the protection of main line batteries and auxiliary power supplies and have approval from the French rail network. For example, Socomec’s Remote Control Isolation Switch Enclosure (ISE) is a solution that integrates a SIRCO MOT motorised load break switch, installed along tram lines. This enclosure ensures the isolation of part of the 750 VDC line under temporary service in case of an operating incident. For the unique demands of urban transport systems, a number of options are available including cable terminal disconnect switches (CTD), line isolation disconnect switches (LID), cleaning channel isolation disconnect switches (CCID) and emergency storage siding switches (ESS). With energy measurement systems to monitor the low-voltage network parameters in real-time – featuring communication gateways, data loggers and an embedded web server – it is now possible to balance the demands of the operation whilst keeping budgets and investment programmes on track. The latest critical power supply solutions from Socomec will ensure the performance of signal boxes, track beacons, lights, signalling substations and safety systems. At the forefront of next generation technology development for the rail sector, Socomec is regularly recognised by important approvals such as PADS. This Network Rail product acceptance process provides assurance that all products accepted for use on or about the rail infrastructure are safe fit for purpose and do not export unacceptable risks to the Network Rail infrastructure. Socomec’s PADS-approved UPS equipment for rail (with or without transformer) and associated distribution cabinets, DC rectifiers and energy converters provide the very latest UPS technology for the mass transportation sector, engineered to provide optimum energy efficiency for high performance critical power applications – guaranteeing network robustness even in the most extreme environments. With proven performance in the field, Socomec’s MASTERYS IP+ Rail Uninterruptible Power Supply (UPS) is available from 10–80 kVA with Network Rail certificate of acceptance PA 05/05998. For operational continuity and the ongoing protection of staff and infrastructure, Socomec’s Masterys IP+ Rail solutions ensure that high quality energy is available at all times, guaranteeing the performance of railway signalling equipment. Socomec’s switching, protection and source transfer solutions are available either in switching enclosures or can be integrated into power supply cabinets on main lines as per ARAL, ARMATAN and ALIZET on the French network. Approved for use on the London Underground, the automatic source transfer switch with integrated bypass is used for normal, emergency and rescue track signalling. 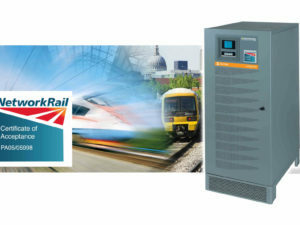 Critical applications at mainline and urban stations – such as IT rooms, Data Centres, emergency lighting and PV production – are protected by Socomec’s UPS equipment, DC / AC converters, Static Transfer Systems (STS) and rectifiers ensuring that telecommunications and passenger information, for example, remain up and running. Socomec’s MODULYS GP high-output Uninterruptible Power Supply (UPS), available from 25–600 kW is a next generation modular UPS and is designed to meet the needs of rail infrastructure for maximum power availability, optimised cost and adaptability in terms of unpredictable power demands. Operational continuity is guaranteed whilst providing the infrastructure with flexibility to cope with short-term capacity requirements and long-term growth plans – with rapid deployment and transparent cost control. Low-voltage installations are protected by switching, isolation and automatic transfer equipment. To optimise energy performance in buildings, Socomec has developed a complete range of products from measurement devices through to energy management software packages. Specific products have also been designed for PV installations, comprising inverters, DC and AC protective devices as well as energy storage solutions. Socomec’s on-board switching and protection products fully comply with rolling stock standards, including resistance to fire, shock and vibration requirements. Adapted source transfer switches ensure the high availability of on-board power. 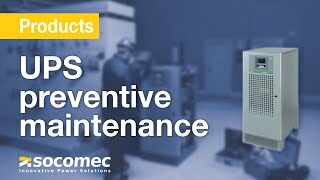 Low voltage installations are protected by Socomec’s switching and protection solutions and measurement devices enable the monitoring of key electrical parameters. High voltage pulse transformers with high voltage withstand are used to control the thyristors used to supply power to electric motors. High frequency transformers control the IGBTs. Socomec’s ATyS S, 40–125 A – a remotely-operated Transfer Switch solution – is ideal for trams. This changeover switch can transfer to the battery source in case of a fault or loss of traction power. It is specially designed as on-board equipment and is light in weight with a small footprint. Delivering innovation to the rail industry requires ongoing support to ensure that the installed systems continue to operate at optimum performance levels – throughout the project runtime – in order to benefit from increased durability. Socomec will assess the unique requirements of the electrical infrastructure in order to develop and deliver a custom solution, including operative training, which will optimize equipment performance enabling energy targets to be achieved. When developing solutions specifically for the unique demands of the rail sector, Socomec’s commercial and engineering teams collaborate with customer teams to address challenges in terms of: power quality and availability; protection, switching and source transfer; energy efficiency (to optimise energy performance, reduce operating costs and environmental impact); energy storage and services and customised solutions. Deployed across a range of railway applications – in every corner of the globe – Socomec’s solutions have strong credentials; including delivering the power supplies for emergency lighting and communication systems for King’s Cross Station in London. Solutions have also been provided for metro and underground systems in cities including Amsterdam, Cairo, Hyderabad, London, Moscow, Santiago, Shanghai and Rome. Main line projects have been undertaken in Belgium, Denmark, France, India, Russia, Portugal, the Netherlands, Italy, the UK and Romania. As a leading power solutions provider, Socomec understands that every high performance rail infrastructure is working within an evolving legal and operational framework – whilst also trying to reduce energy consumption and improve performance. With a particular focus on energy management and reducing an organisation’s impact on the environment, Socomec has a pedigree in energy efficiency. Effective energy management starts with accurate measurement and centralized monitoring – in order to reduce energy bills and strengthen green credentials. The most advanced low voltage electrical solutions for rail system architectures guarantee network safety and robustness; metering provides critical information on the status of an electrical network which can anticipate potential issues affecting reliability as well as delivering demand side reductions and lower costs.